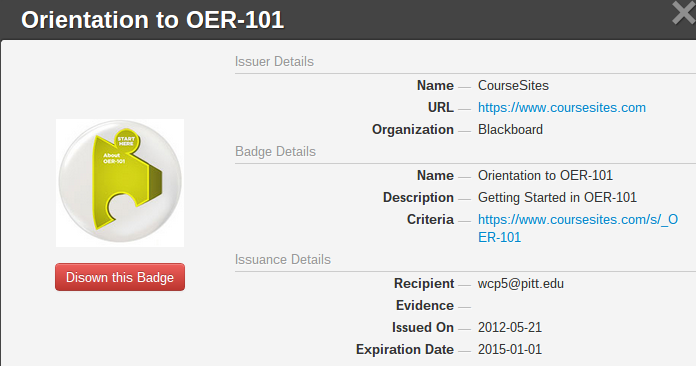 Enhance your teaching with Open Educational Resources… And earn badges, too! Home » Opportunities » Enhance your teaching with Open Educational Resources… And earn badges, too! It is asynchronous, meaning that there are no set lecture times or work times. There are no set deadlines, meaning that you can work on and complete the courseat your own pace. Although you will not receive traditional college course credit for completing the course, you will receive digital “badges” from SUNY proving that you completed the coursework and gained the skills and knowledge taught by the course. The badges are managed by the Mozilla Open Badges framework. (Mozilla is the non-profit organization that develops and maintains the free open-source Firefox web-browser.) These badges are very much on the cutting edge as credentials; I’ve attended several technology-in-education conferences in the past year, and there’s absolutely massive buzz about them. Since then, I’ve earned two more badges for completing the first two modules of the course. If you would like to learn more about earning badges as professional credentials, you can read Mozilla’s explanation here. I invite you to consider participating in this course about Open Educational Resources. Given the fact that it’s free and self-paced, there’s essentially zero barrier to entry, and I believe the skills and knowledge taught by the course will have ready application in your teaching. Thanks for catching that! It’s very odd– I noticed the link had disappeared earlier in the draft stage, and I re-added it yesterday. Yet it somehow disappeared once more. I imagine one of my editing apps must have a bug in it, since I’ve edited it in my web browser, on my Android phone, and on my iPad. Thanks for the tip about this really interesting-sounding course. The topic excites me, as I’m always interested in open access materials. I’ve already enrolled and am exploring their content. I first heard about badges as credentials at a gaming conference, where feelings were mixed — either “this is gamification of something that has no business being a game which makes it a gimmick” or “this is a great way to update credentials for a new generation of scholars and learners”. I’m not sure where I stand in that debate yet, myself. I think they’re a great idea! 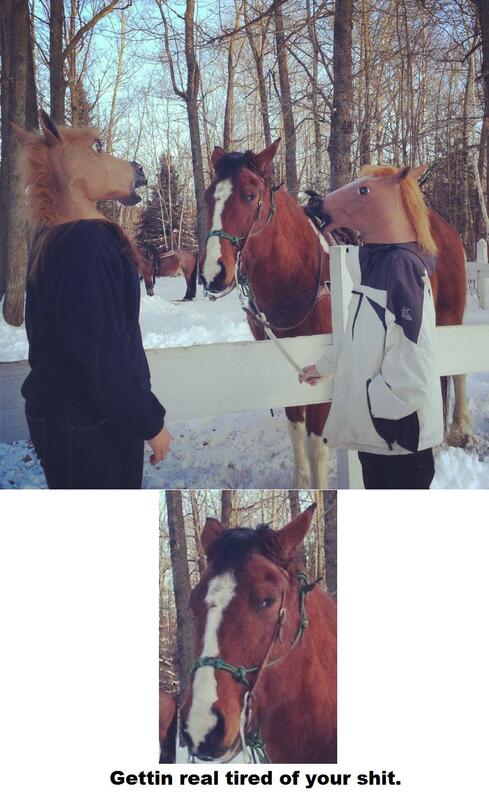 The equestrian is whether employers will take them seriously.